The last part of Sony's press conference was about Uncharted 4: A Thief's End and Naughty Dog delighted players with brand new footage from the game. Watch the direct feed for both the trailer and gameplay demo inside. The details and added scale are just so good. Looks really smooth too. When they jumped into the jeep i was honestly expecting a cut-scene to trigger. Seems they've turned everything that would have been non-interactive in previous games, into actual gameplay this time around. 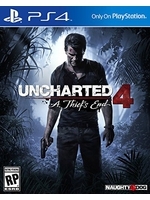 As for Uncharted 4, it looks incredible! Perhaps The Order looks better, but it's basically a interactive movie. From a technical level, Uncharted 4 is much more impressive. The amount of details, quantity of objects, gameplay, scale and etc easily surpass The Order. Naughty Dog's technical excellency is unbelievable! We're going to bed now, it's now up to the L.A. team to take over if they have anything we haven't shown already. Good night guys. The return of the King !! This is it...This was incredible. In my opinion this is the most impressive game I have seen. Incredible. Now the only other thing I need is the HQ trailer of MGS V, can I still expect that? How the game is this smooth with this amount of detail is just insane. This was quite impressive. Frame rate, detail, color pallet, no noticeable aliasing, minimal pop in, fantastic artwork, and of course the things that we come to expect like the charming characters, animation and dialogue. I'm super excited for this and can never get enough of this series. My thoughts too. Except I think the attention to detail of The Order is quite crazy too if you zoom in on random out of the way objects in photo mode. It's just not as open world as UC4. Mobs are still a bit bullet spongey, but HELLO destructible environments/cover. I thought about that TinTin movie when i saw that car chase. Gunplay still looks weak, especially the handgun. This is the game i will finally (been saying that since the release) buy a PS4 for lol, looks absolutely bloody amazing! Looks good but nothing special to me. Disney should hire them to do an Indy game. 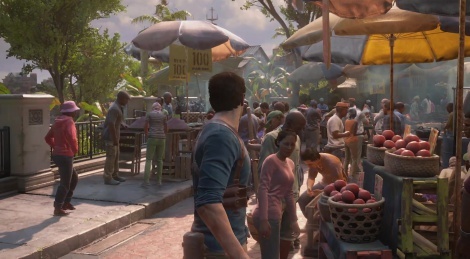 Those images... Uncharted 4 looks stunning, and it won't be linear as a corridor. So much quality, so much detail, gameplay looks fun and the dialogue is quirky and well written. This may become the best Uncharted yet. looks good....BUT no blood, he was shooting all those guys and not 1 bit of blood is scene even if they did not want blood splatter in the game they should still have had bloody bullet holes on the clothes or something. uncharted has never had a ton of blood. the last of us this aint. it's akin to indiana jones. the voilence is toned down. 7 minute gameplay and 491 mb?Is this hq video?